Nightmare at Camp ForrestwoodBy Kelli Sue LandonCopyright 2011 by Kelli Sue LandonPublished by Outskirts Press http://www.outskirtspress.comISBN 978-1-4327-7086-0 $12.95Nightmare at Camp Forrestwood by Kelli Sue Landon was a surprisingly interesting read. As it is marketed in the young adult category I wasn’t expecting much of a “whodunit?” aspect to the book but I was pleasantly surprised. I also didn’t see the guilty party coming, though there was plenty of explanation after the fact as to why he or she did the terrible things that were done.I found Nightmare at Camp Forrestwood to be an engrossing read. I started and finished it in the same day over a period of about eight hours. It wasn’t that the story was too easy, rather it was too good, I wanted to know what was really going on at Camp Forrestwood and who was behind it. Once I was invested in the tale I had to keep reading to find out what was going to happen next and to whom and more importantly to see if I could figure out who was doing it ( I couldn’t ).I thought the storyline was clever and creative and only slightly predictable, in that a bunch of kids go to camp and start turning up dead and there is no phone, no technology – which is explained – and no help available. I would have been a little more convinced of the reality of the storyline had it happened over a shorter period of time, but it went on for more than a full day so it was a little hard to believe a group of high school seniors couldn’t band together and get out to find help during that time. Overall, I thought the author did a fair job of portraying the tension of the situation and the results that tension would have on a group of teenagers. I thought the mystery was believable except for the amount of time it encompassed before help was finally reached. I thought it did a good job of showing how suspicion of even innocent people can be raised in extreme circumstances and how stress can tear people down or bring them together to fight a common enemy.I would recommend reading Nightmare at Camp Forrestwood. I found it interesting and enjoyable and except for the setting, hard to predict what was coming next. I think it would be appropriate for even upper middle-graders as well as young adults, though I would avoid going any younger because of the gore involved in the story. This is my second book by Kelli Sue Landon and I really admire the way she creates mystery. Her mysteries are impossible to figure out until the very end. You're discovering everything that's going on along with the main character. You're just as clueless as they are. As you can tell I really love the mystery aspect of this book. I loved it in her other book, Sudden Moves, also. I love me a good murder mystery and you don't get those very often in young adult books. One of the problems I had with Sudden Moves was the relationship between the main character and the guy she liked. Landon really improved the relationship in this one. It was much more realistic and I didn't feel that the love interests were being pushed together at the last minute.Another thing I loved is that Landon isn't afraid to be gruesome. I was looking behind me scared because her descriptions were really gross. I absolutely loved it!Now the things I had a problem with. One was the immaturity of the kids in this book. They didn't act like they were seniors in high school. They were all running around screaming at each other and calling each other names I heard in the middle school. Another thing I had a problem with was the unrealistic reactions from the students. At my school if we were camping and a kid went missing we would not be having dances and drinking spiked punch. Also if we found a dead body in the bathroom we would not be calmly talking about plans or fighting and calling people names. Everyone, realistically, would be in panic mode and screaming and crying. Overall I really enjoyed this book. It was short and sweet and really had a great mystery surronding it. 3 1/2 stars! I enjoyed Kelli Sue Landon’s first book Sudden Moves. I had no reason to believe I wouldn’t like this one. I was not disappointed. I have always like scary stories and this fit the bill. Holly has recently moved to Madison High because her father passed away. She doesn’t fit in very well. She is befriended by an even bigger outcast, Erin. The senior trip comes up and Holly encourages Erin to go with her on the campout. This is where the jealousy sets in. Holly talks with another girl, Mindy and Erin gets mad.Things go from bad to worse right from the beginning. The first night a counselor and one of the girls go missing. Then the students and counselors start disappearing one after another. Holly, Matt, and Mindy must now try to figure out who the killer is and try to avoid being their next victim. One thing that made this such a tasty read was they set everything up with a rumor about a mentally challenged boy and a murder at the campground. This was a great book. I look forward to reading more by this author. The twists and turns she puts in her books will keep you coming back for more. I won this book for free through Goodreads First Reads. Hope to read it soon. Thanks. 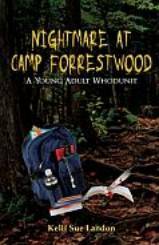 Nightmare at Camp Forrestwood is an engrossing young adult thriller that will hold you fast, page by page, a prisoner to the writer as are the students in the camp. If you are a fan of YA Mystery, then you will love this book. I loved her first novel, 'Sudden Moves: A Young Adult Mystery', however, 'Nightmare at Camp Forrestwood' is even better. Intense and suspenseful. (Yes, Forrestwood is spelled correctly. )REVIEWThe book has a slow start as each character was brought into play. Once the action starts, you get pulled through so quickly, you become part of the story -- frantic, scared, and running for your life through the dark woods, pursued by an unknown assailant.The immature and "high-school" in-fighting between students was spot on, yet it seemed more like students from Detention on a camping trip, rather than the Senior class. Landon used this interwoven clash of classes to feed the nature of the plot.Mystery and fear mounts as students start to disappear. I took a loud audible breath when the first victim was discovered brutally murdered. All 'tough guy' and 'upper class' facades crumbled, and what was left were teenagers, caught alone, in a horrific circumstance of murder. Speculation and accusations start to surface, as Landon takes fear to the next level -- terror. Panic ensues, resulting in rash behavior, causing students to run foolishly out into the night, unprotected and vulnerable.Until the first murder, I was certain the entire "scare" was some horrible teen prank. I found myself pulled into the story, and running with them, struggling to survive. And what was unnerving, and expertly written, was the identity of the killer remained a secret until the end of the book. "Nightmare at Camp Forrestwood" is Kelli Sue Landon's second novel and a hit. I recommend this for the tween reader on up... (there is minor cussing and a very minor suggestive segment, that adults may not find appropriate for younger children).Thank you, Kelli, for another great YA Mystery. I look forward to your next adventure.I received this novel directly from the Author. Nightmare at Camp Forrestwood is a quick read with a lot packed into it. You will not want to put it down once you start reading it. It is full of mystery and suspense.Holly, a senior in high school is a new student at Madison High. She hasn't made many friends and is excited to go camping with the senior class. She talks her friend Erin who is kind of an outcast into going to even though she is pretty much against it. They are not allowed to take cell phones or any kind of electronic devices on this trip. They are going to stay at Camp Forrestwood, a place with some gruesome stories. The first night while they are having a campfire things really start to pick up with the story. People start coming up missing and then are found dead. Who is the killer and who will end up dead? The author is such a great storyteller. I felt like I was right there camping with everyone. I could imagine myself being in that scene looking over my shoulder the whole time. This is the second book that I have read by this author. Let me tell you she writes some great mysteries. I could not figure out who the killer was and was quite shocked when they were revealed at the end. There is lots of mystery and suspense. Just to add one more thing that I liked...I thought the way the author brought the characters together was great. Sometimes in high school, people are separated by who they are, jocks, geeks, etc. When things started going wrong, this didn't matter, everyone stuck together. I'm a fan of this author and look forward to see what she is going to come up with next. This book was provided to me by the author and/or publisher for review. This did not affect my review in any way. Kelli Sue Landon - Kelli Sue Landon is from Peoria IL. Her published short stories include The Diary, Pizza Night, Campfire Dreams, and The Assignment. She has been writing short stories since the age of sixteen. Her collection of short stories entitled Short Tales is available through . She has published five novels: Stranded in Time, Sudden Moves, Nightmare At Camp Forrestwood, Summer Shack and The Henderson Harbor Killings (Summer Shack Prequel). Christmas Past and Stranded in Time (her first time travel novel taking place in the 70's) is a favorite among fans. Her novels all center around a trip of some sort and are written for the New Adult genre, with characters in late high school/early college.